Is Expedition Cruising for You? This week, I've been booking some folks on expedition cruises. I've booked some folks to Antartica, and I've booked some to Galapagos - I also got a wonderful offer for a solo lady (with solo supplement waived) to Galapagos with Lindblad Expeditions. I've finalized a trip around Iceland for another. And I've booked a family to the Mekong, as well as folks to the Amazon. How do you know if expedition cruising is for you? What the heck is it, anyway - do you know? Many folks think expedition cruising is roughing it - and while it is not a luxury cruise with a butler (although Silversea does offer butlers on their expedition cruises), most expedition cruising is about the wildlife count rather than the thread count on your sheets. It's about the adventure. It's about interacting with naturalists and biologists and historians onboard, and learning. And it's about the experience. Expedition ships are comfortable, for sure, with good food and service (and there are forays into even better ships with higher-style accommodation and food - Lindblad is building a new ship, as is Scenic). But, generally speaking, expedition ships are far from being a European river cruise barge or a cargo freighter (there are some older Russian icebreakers with Quark). Expedition cruising is often the best way to get close to where you want to be, and get into the little nooks and crannies of a destination - so you're being immersed in the destination. 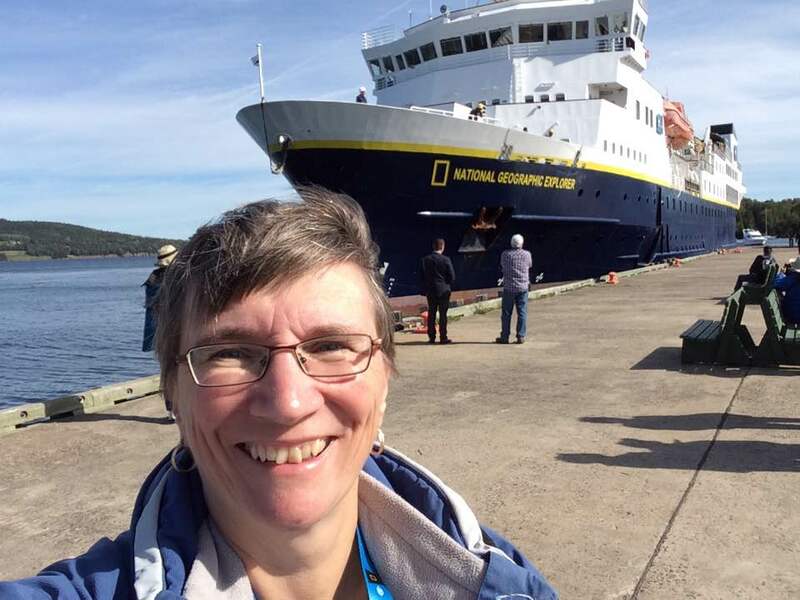 Generally speaking, expedition cruising means you travel on a ship - but then use a zodiac or a skiff to get to shore (because most expedition ports are not regular wharves - although my picture here is me in Louisburg, Nova Scotia on a Newfoundland circumnavigation cruise I did with Lindblad.) You have to be able-bodied to climb stairs, and get into a zodiac - and there can be a combo of wet and dry landings (whether or not you jump into the water to walk to shore). You're not going to have large Broadway shows onboard an expedition ship. And you're not going to be travelling with a moving city like some of the larger ocean cruises (Royal Caribbean has some with over 6,000 passengers, but the biggest expedition ship tends to be under 200 people.) You're not going to have rock-climbing walls onboard (but you might be able to go rock climbing ashore). You're not going to have large pools and cabanas and umbrella drinks for everyone onboard either (although there are fully stocked bards). You will have very skilled and trained expedition staff who will know the destination well, and who will ensure you are given an authentic experience - and you learn as much as you want to learn. Each night on an expedition ship, you generally have a naturalist giving a talk. This isn't university-style lecture - it's more like watching a Discovery Channel episode. If you know more, or what to learn more, there are opportunities to dig deeper. As an example, on my Lindblad journey around Newfoundland, we had a Viking historian give us a talk about Vikings at night, and the next day, he led the excursion to L'anse aux Meadows' Viking settlement to help us interpret what we were seeing. Other neat things? Expedition cruising often means there is some flexibility with the itinerary. We saw some fin whales on our journey - the captain stopped the ship, and invited everyone to the bridge to see the whales. The naturalists showed up books and helped us identify the blow of a particular whale . The ship didn't move until the whales had moved on. That was really spepcial. And often, especially with Lindblad Expeditions, there are National Geographic photographers onboard who will give lessons and tips, as well as show you their photos of your trip. I’m a Virtuoso, Let Me VIP You!